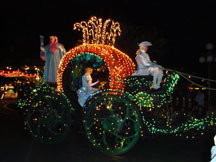 Close your eyes and what image comes to your mind when you think of Cinderella? A castle, glass slippers, magic wands, a Cinderella bridal coach, a handsome prince charming, and a fairytale life ever after which are all the necessary ingredients to create your dream wedding. With a little planning, you can turn your special day into a romantic, enchanting day that you and your guests will always remember. The magical day that you have been waiting for is finally on its way. Planning for your memorable celebration is a process that requires attention to detail and a willingness to do some research. Read on and let’s begin making an easy to follow, workable plan. Set the tone for your Cinderella theme wedding with your "Save The Date Cards" and your invitations. 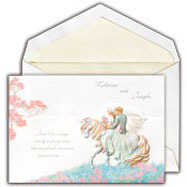 What an image this wedding invitation conveys – you and your prince charming are riding off into the sunset to enjoy a fairytale life. If money is not an object, how about hiring someone to dress up in morning tails and hand carry your invitation to your local guests. They could have the invitation sitting on a silver platter or on a beautifully decorated white pillow. You will need to pay attention to the cut, color and fabric of your dress and determine what suits you. Cinderella bridal gowns never go out of style and the features include: sweeping trains, layered tulle skirts, off the shoulder sleeves, sparkling beading and crystals, and a full bell shaped skirt that can be puffed up with a petticoat worn under your gown. A tiara with a long veil will enhance your fairytale gown. Your hair should be worn up and a choker worn around your neck will augment the Cinderella motif. Wearing white gloves will add a touch of class and elegance. The groom can wear a black or white tuxedo, and if you’re getting married in the morning, tails may be worn. 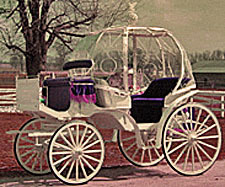 How neat would it be if you and your hubby could arrive in a glass Cinderella coach? They are not inexpensive but definitely worth a phone call to determine the cost. 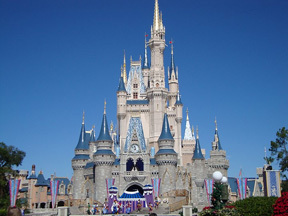 If you can afford a destination wedding, the ultimate Cinderella theme wedding would be to get married at the Disney World Castle in Florida or the Disneyland Castle in California or Paris. 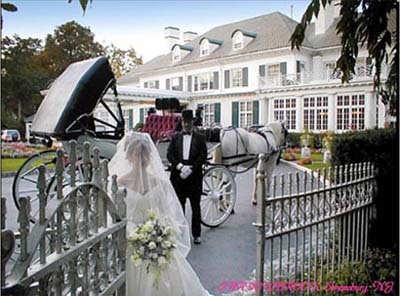 For a more affordable reception, choose an old castle or mansion if there is one near your home. Be certain that the castle has proper heat and air conditioning; you don’t want you and your guests to be too hot or too cold during your reception. Another choice for your Cinderella theme would be to have your reception in a catering hall or any room that you can decorate in a fairytale style. You can transform any wedding space into a Cinderella theme by using balloons, columns decorated with silk flowers or ribbons and big bows. The chairs can be covered in silks and satins. Candelabras and elegant flowers will make fabulous centerpieces. If there are any undesired areas that you would like to hide, consider using iron or wood trellis’ and weave vines and other greenery into the slats. Place twinkling lights around your room and use candles wherever possible. Ask your caterer if it would be possible to make a coach or glass slipper ice sculpture to be placed on your buffet table. 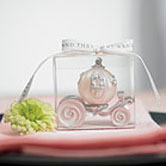 So, if arriving in a Cinderella wedding coach is not an option, how about using a Cinderella coach candle as your favor? It will serve as a decoration as well as your favor. Or, how about using the above regal crown wine stopper, complete with the mandatory crown jewel as your favor? 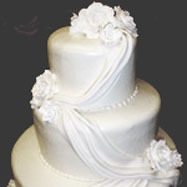 Your bridal cake is one of the main focal points of your reception. You can have a white cake with a touch of pink. 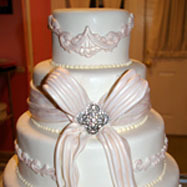 Or you can have a tiered cake with a sash as seen above. You can use the Disney, Cinderella and Prince Charming figurines as a cake topper. For an added fairytale look, you can place a glass slipper at each corner on the cake table. A Cinderella theme wedding conjures up thoughts of romantic fairy tales, princes, princesses, enchanted castles and a long happy life. Check out my links below for more ideas on how to plan your perfect memorable wedding. Come visit my Welcome page and learn some secrets for planning a perfect wedding.